Storage: Store in a cool dry place, anti-stuffy, moisture-proof, moth-proof. Dry and easy to save, ordinary bags are generally seven to eight into the dry, not a lot of accumulation of stock, often remove the sun drying below, or over time will sticky metamorphism. Wolfberry nutrient-rich, but also a difficult to preserve the product. Often due to environmental conditions, the emergence of worms, moldy, discoloration and other phenomena. Storage should pay attention to control the water content, temperature, oxygen content in the air, pest control, pest control and so on. Wolfberry fruit drying, drying time takes longer, you need to consume energy or natural weather restrictions, processing costs increase. Looking for ideal Dried Fruit Red Wolfberry Manufacturer & supplier ? We have a wide selection at great prices to help you get creative. All the Natural Dry Red Goji Berries are quality guaranteed. 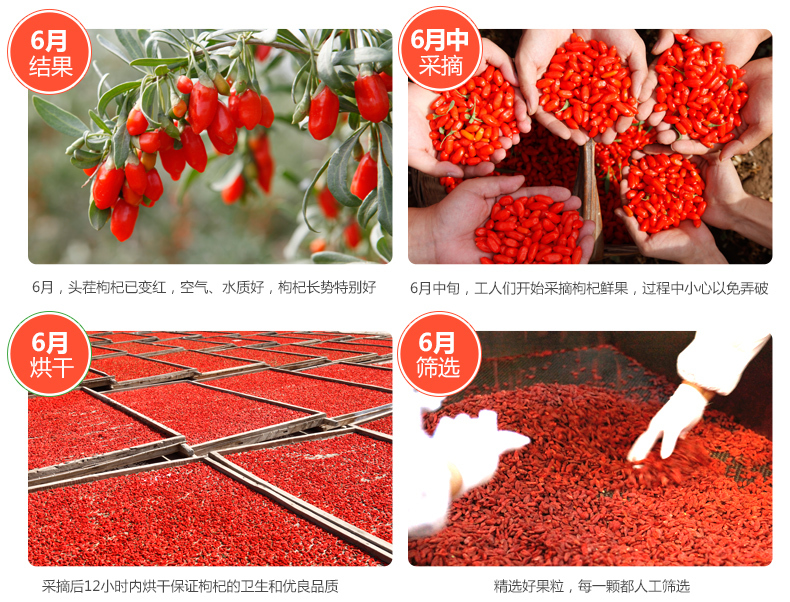 We are China Origin Factory of Natural Sun Dried Goji Berries. If you have any question, please feel free to contact us.